I’ve always been inspired by solar panels… and the idea that pairing them with transportation could lead to a quieter cleaner way of life. Imagine seeking out sunny parking spots instead of shady covered ones. Imagine not having to stop at the pump so frequently, not being trapped in a system that damages natural areas, pollutes the air and disrupts cultures. Part of this dream was realized for me a couple years ago when I purchased a used third generation Toyota Prius with integrated Kyocera solar panels! Unfortunately, these panels only serve to power an air circulation fan designed to reduce cabin heat during hot summer days. One very special electric bike company called Organic Transit has taken the next step, offering solar panels that actually charge their ELF ebike velomobiles. And a handful of creative tinkerers have adapted non-solar electric bikes to run off of independent solar arrays including Marissa Muller who towed two SunPower 240 watt panels over 3,000 miles across the US behind her 2014 Specialized Turbo S. So much is possible in this space but not everyone has the technical expertise, unique toolset or budget to make it happen in the way Marissa did. 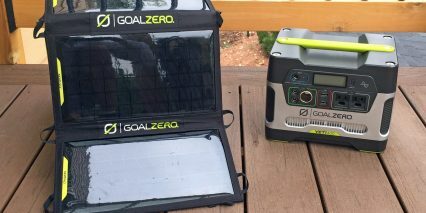 Not everyone has the space for a trailer… or the desire to pull it, and that’s where the Goal Zero solar generator kit comes in. 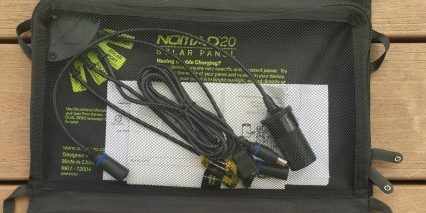 For this review I’m covering the Yeti 400 battery pack and Nomad 20 folding solar panel bundle, referred to as a “solar generator kit”. 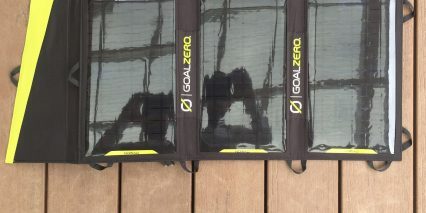 There’s a not a huge discount if you buy them together like this and indeed, if you want faster charging there are larger panels available from Goal Zero such as the Boulder 30 but they aren’t as compact. 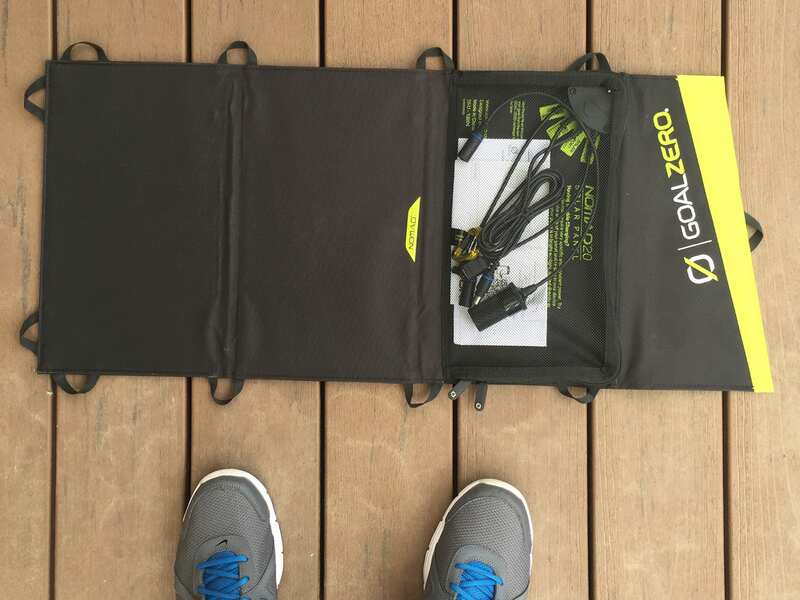 I chose this bundle kit for myself because it balanced portability with utility… you can charge two 110 volt devices, two USB devices and one 12 volt device here and there’s enough juice to fill an average sized ebike battery once or a laptop three to five times. That was my primary interest as someone who travels frequently and works on the go. 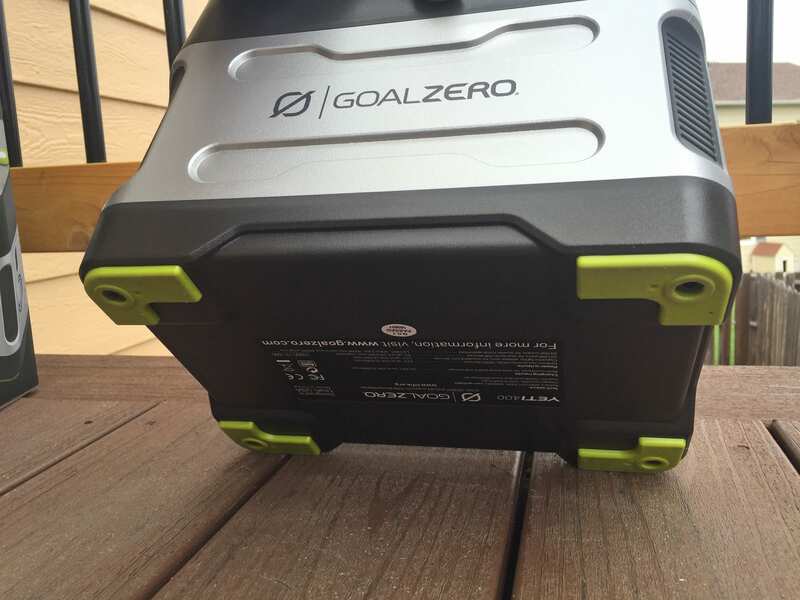 The Yeti 400 uses Absorbent Glass Matt (AGM) batteries that aren’t especially durable, long lasting or light weight but the pack can be replaced for under $100 when it eventually does expire. 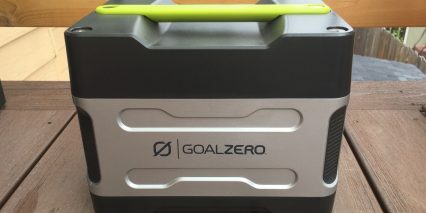 Goal Zero estimates you’ll get between 500 and 800 full cycles from the pack (which is more than it sounds like) but that’s way less than Lithium-ion packs that average 1,000 to 1,500 and aren’t as prone to developing a charge memory. As for the Yeti 400 and its AGM pack, just keep the outer shell in good shape so you can reuse it down the line. Swapping batteries looks pretty easy as I was able to open mine in just a few minutes with a hex wrench and all of the wires were color coded. 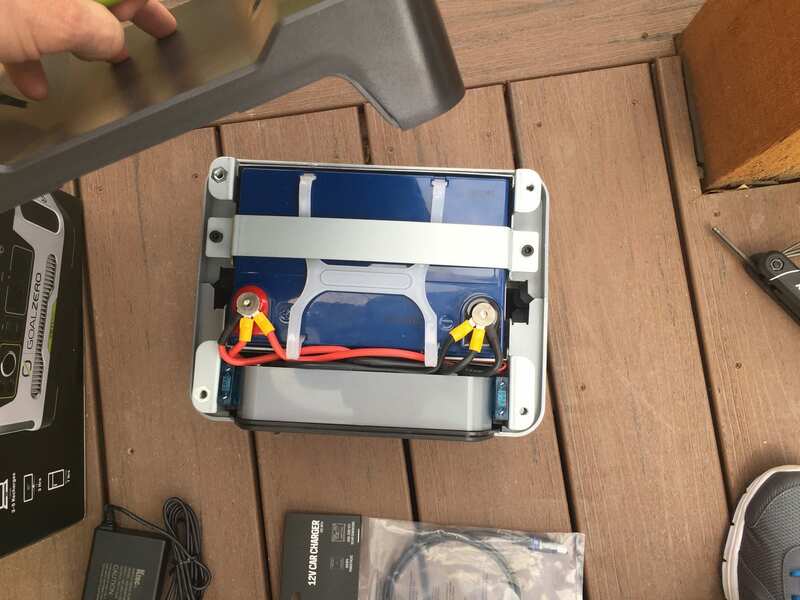 So let’s back up here, this is basically a 30 pound car battery with a nice plastic interface? 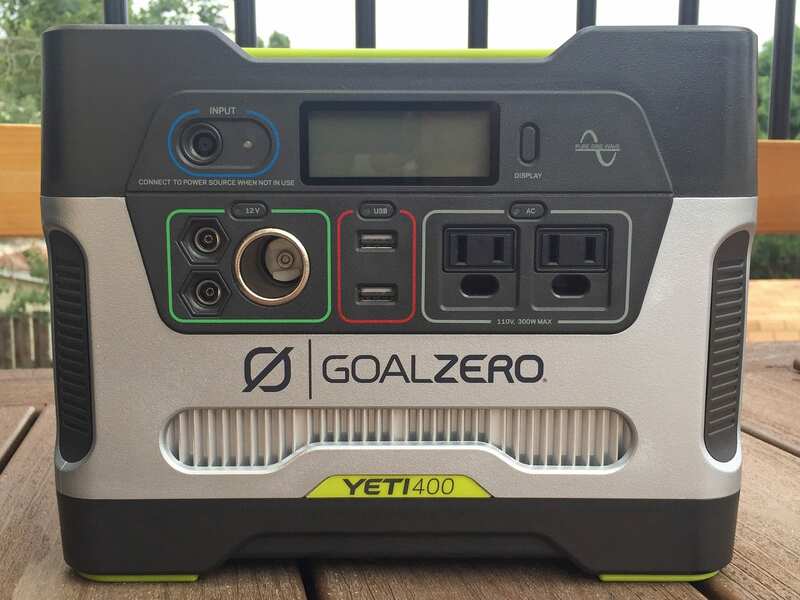 And the Yeti 400 on its own (not including solar panels) costs $459?! Yeah, that’s a tough pill to swallow and indeed, you may be able to create your own system for much less. What pushed me over the top here was the backlit LCD interface with handy readouts like charge level, power output and battery warning. 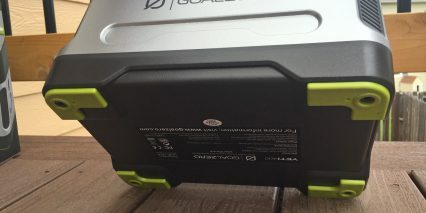 As mentioned before, AGM batteries are kind of sensitive and Goal Zero has lots of warnings on the box, instructions and pack urging you to top it off ever 90 days or so. 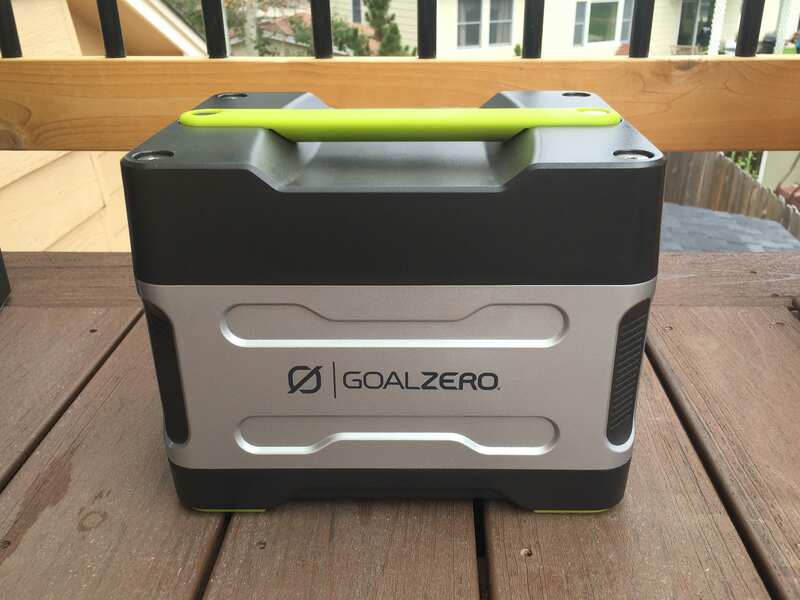 I’d recommend checking it monthly or even weekly… My Yeti 400 arrived nearly fully charged but after sitting unused for a couple weeks it went down to 60%! Other features I liked were the soft rubber feet that reduce vibration (since I’m taking mine with me in my car) and prevent scratching of delicate surfaces. 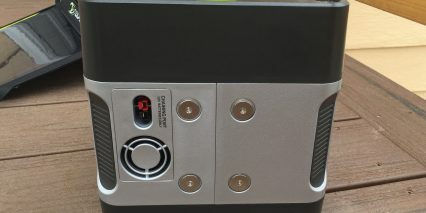 There are two small fans (one on each side) of the Yeti 400 designed to keep the pack cool along with a nice heat sink along the front and of course, all of the charging ports. I have yet to hear the fans activate and LOVE how quiet this thing is compared to a traditional internal combustion generator. Even the quietest ones still produce a noticeable amount of noise and the smell of fuel is difficult to clean off. 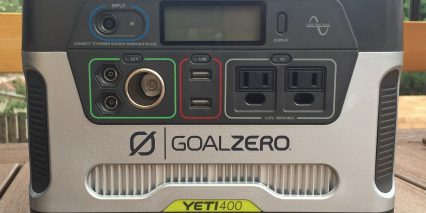 Back to the Yeti 400, I love that the different charging interfaces can be turned on and off independently, this should reduce phantom power draw. And finally, I’m not an electrical engineer and I just don’t want to risk having something go wrong. I’m willing to pay nearly double what it would cost to DIY (not including my time) to have a product with a toll free support number and a warranty. I don’t want to end up with a fire and I don’t want to try and fix this thing myself… That said, the warranty isn’t great with just 180 days coverage on the cells… the pack and other accessories like the solar panel get one year. Again, this goes back to how sensitive AGM is compared with Lithium-ion. Some closing thoughts on the Yeti 400: I love the integrated handle, it slides down and stays out of the way when not in use but feels sturdy and is easy to grip when carrying. Given that I’m taking the Yeti 400 with me in my car I plan to run some straps through the handle and attach them to my seat mounts so the pack doesn’t go flying if I’m in a car accident or roll… as mentioned earlier, this thing is heavy! I was a little bummed when pulgging in the Nomad 20 solar panel with overcast skies as it only said “low” for input vs. some Amp reading. Plugging into the wall directly showed ~66 Watts. The output to charge the Specialized Turbo Levo test bike was around 0.6 Watts which seemed low, the charger is rated for 5 Amps? 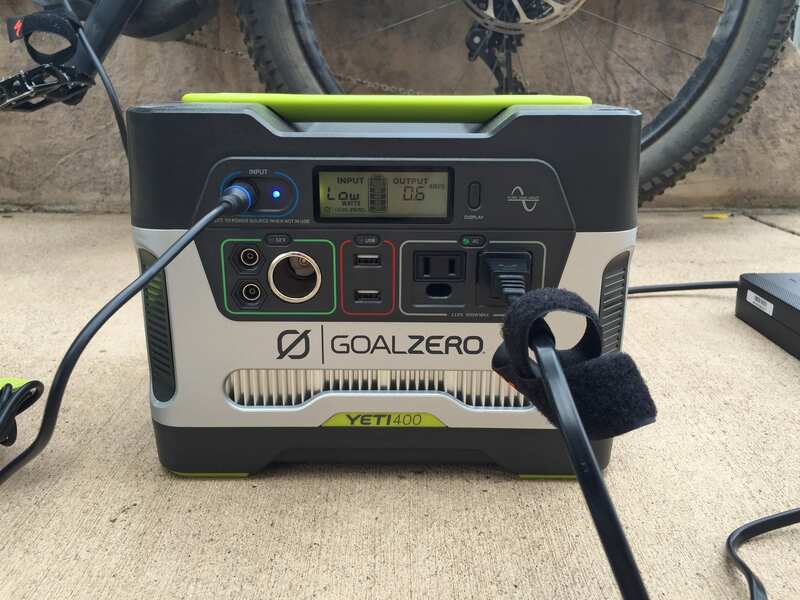 When reading the Goal Zero website it said the Yeti 400 can output electricity as fast as you would get from plugging directly into a wall outlet. 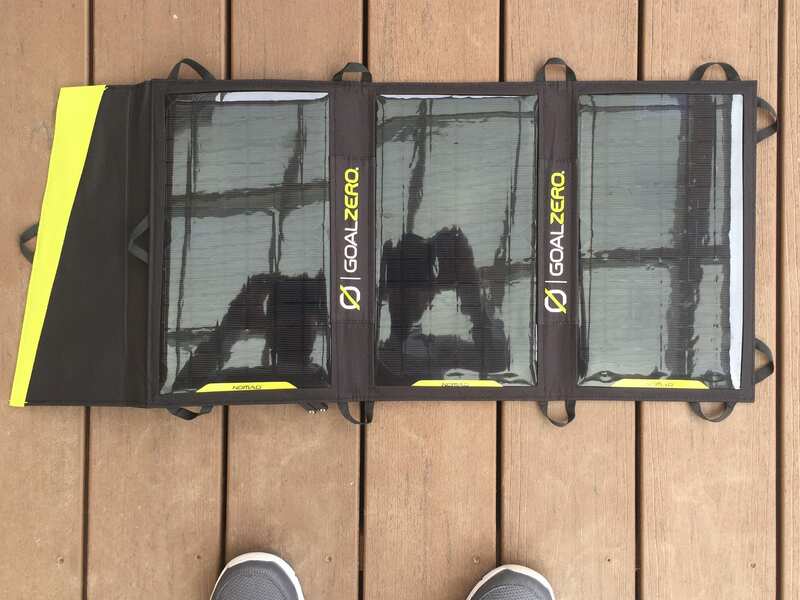 Switching over to the Nomad 20… this folding solar panel array looks great, has plenty of loops for mounting to windows, the sides of structures or the top of a bike rack or trailer (if you were carrying a battery along). 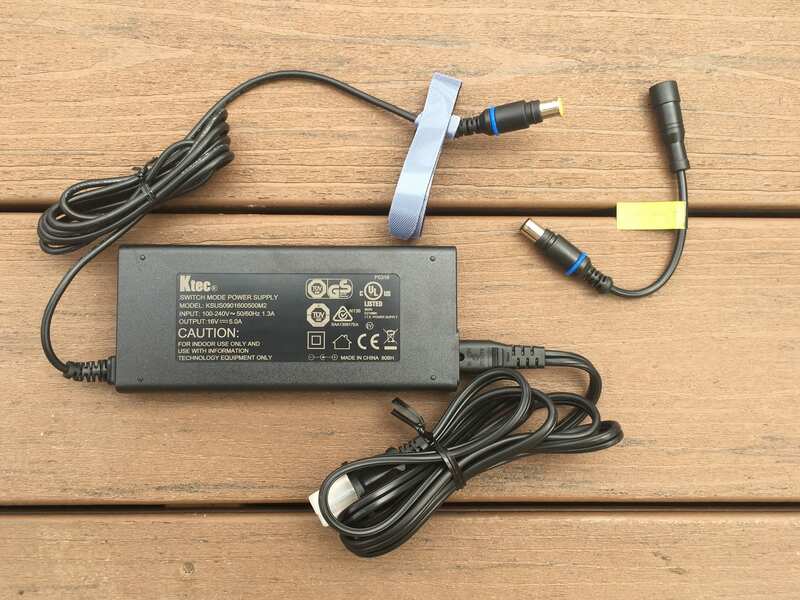 I love that it includes multiple built-in power ports including USB and 12 amp which come in handy for phones and other portable electronics. 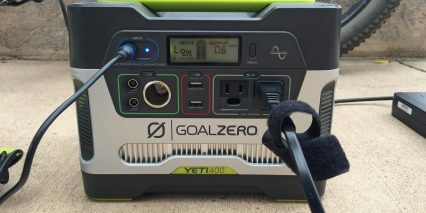 However, given that it can take anywhere from 50 to 80 hours to charge the Yeti 400’s 396 watt hours of capacity… it’s not as practical as it is cool looking. These depressing stats are what motivated Marissa Muller, mentioned earlier, to use 480 watts of solar panels for her cross-country ride. Her panels were much larger, weighed more and cost a heck of a lot more (I think she had to work with SunPower directly to get them) but they actually provided enough juice to charge and ride daily vs. waiting a week. 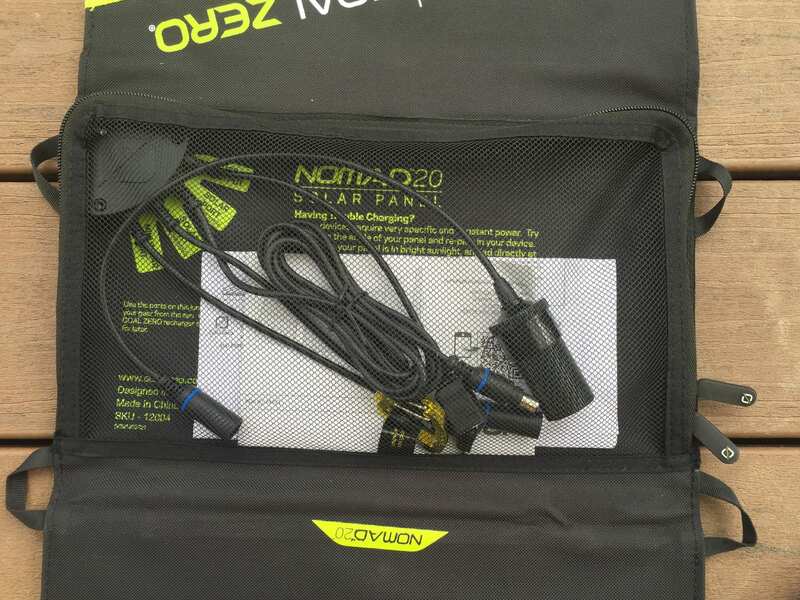 Before you get too bummed out, note that as with the Yeti 400, you can chain up to four Nomad 20 solar panels together for a total of 80 watts and that should lower the charge time of the Yeti 400 down to 15 to 25 hours with good light. 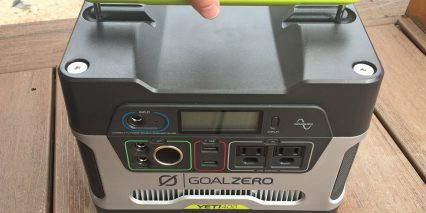 If you’re not as power reliant as I am and want to spend less and lower the weight of your battery solution all while still having access to a standard 110 volt plug outlet consider the Yeti 150 from Goal Zero. I was so close to buying one of these but ultimately spent the extra bucks because I plan to charge using my car’s 12 volt cigarette lighter while I drive. This should offer a full charge in just 13 hours and I can always top-off with solar when parked. 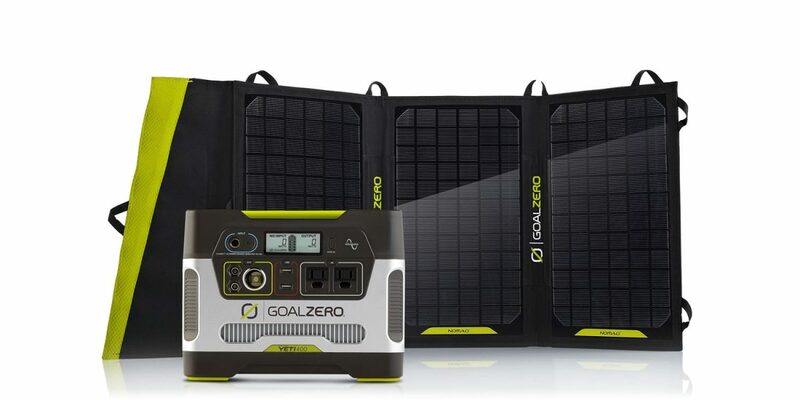 My Goal Zero Yeti 400 solar generator kit will be used primarily for powering my laptop and with the potential for multi-day camping trips without moving my car and the slower solar-only charging option this just seemed like the way to go. 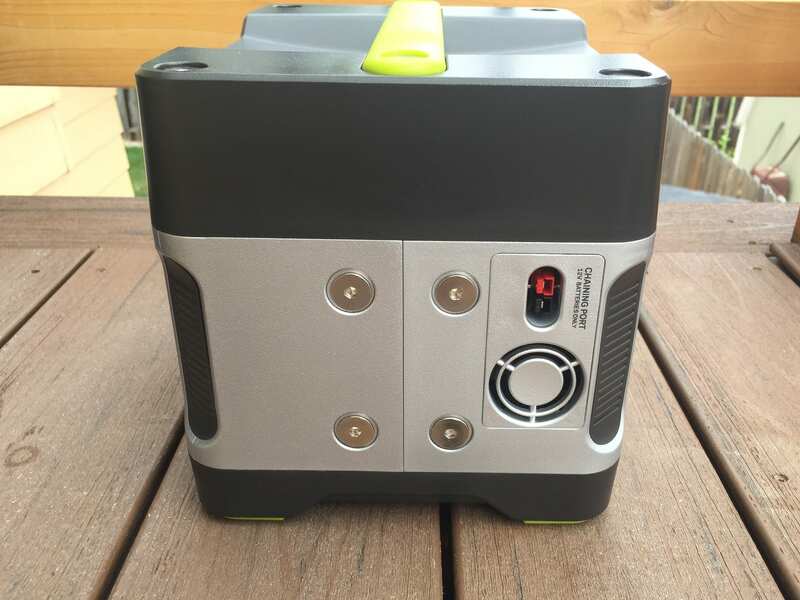 Charging times are reasonable if you plug the pack into a wall (5 hours for 110 volt outlets and 13 hours for a 12 volt car outlet) but if you actually charge using the 20 watt solar panel it will take between 40-80 hours to fill completely! questions asked, within one year. I’ve been using the Yeti 1250 as a home generator, and use it to charge my Specialized Turbo (base model) that bought on sale about a month ago for $2,500. Been enjoying both bike and generators!! Hi! So do you think can I use this for a long trip, biking all day on summer? 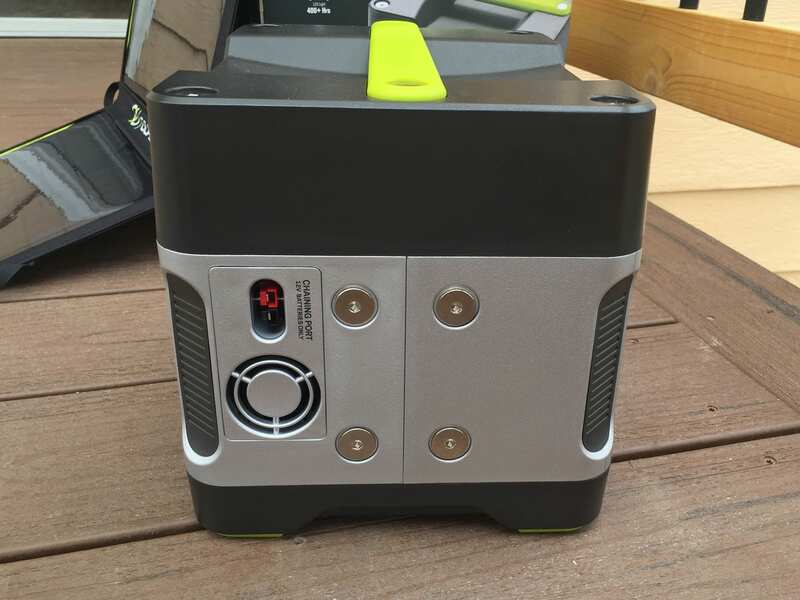 I have a Haibike Xduro Trekking S with Bosch 500 PowerPack. Battery (36V, 13.4Ah, 500Wh). I’m thinking to buy a bike trailer and put this set on it. I buy one more extra battery and charge it during the ride. And find a camping for the night. Wow, that sounds awesome Norbert! There are many “it depends” factors here, such as the weather. 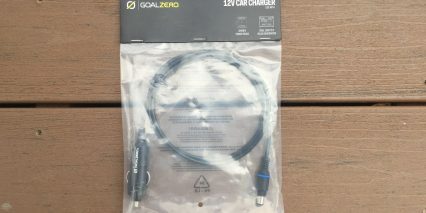 I could see this working very well for multiple charges… but you might need to stop occasionally to top off the Goal Zero at a gas station or food stop. Many places will let you plug in for free (it only takes ~$0.25 to fill). 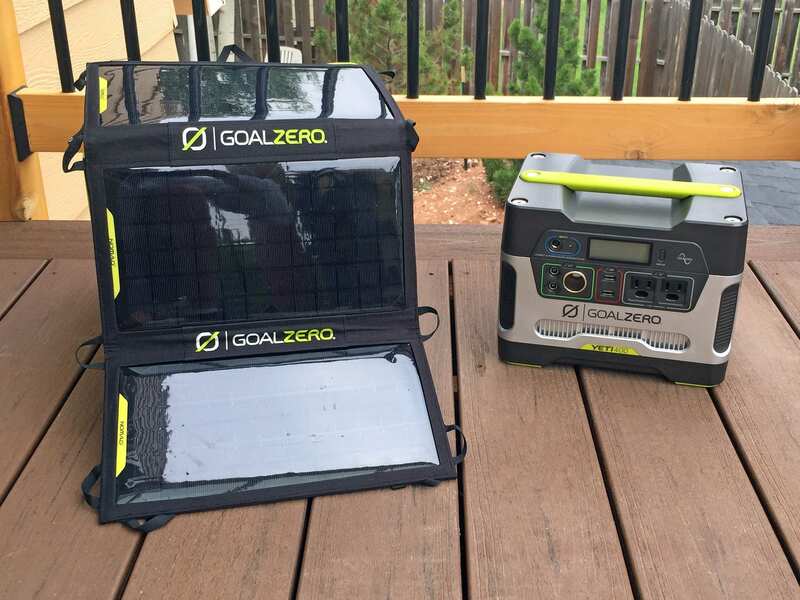 The Goal Zero may slowly run down as you recharge the PowerPack, not fully re-filling with sun energy between stops. It’s good for almost one full charge, and I recommend refilling before your PowerPack reaches ~10% because then you get almost full charge from the Yeti 400 and it can begin refilling sooner. I’d LOVE to hear what you end up doing and how it works. 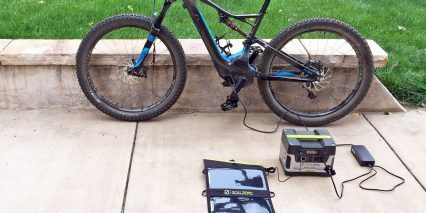 Another path would be to have two PowerPack batteries and get a custom solar panel made by the folks at Hi-Power Cycles. 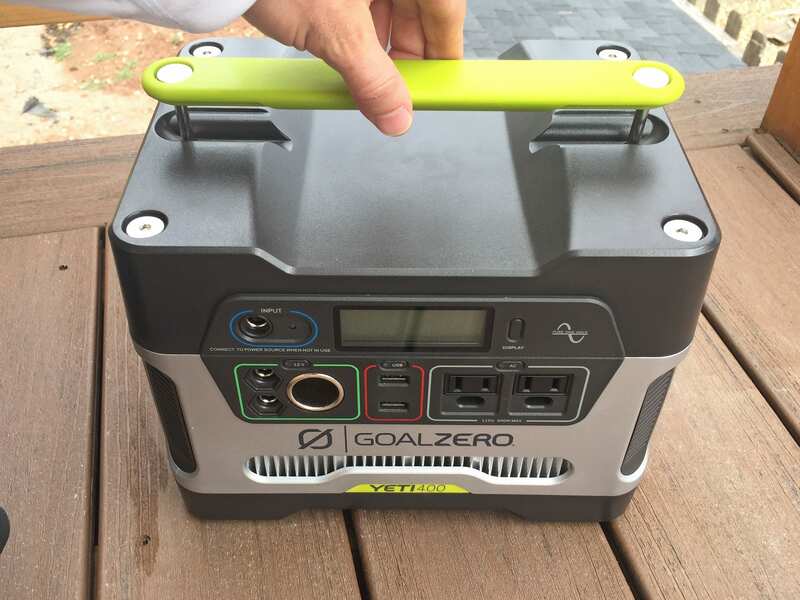 I think they could make a Bosch interface and then your lighter weight second PowerPack replaces the Goal Zero (which uses heavy Sealed Lead Acid) completely. The downside is that you don’t get all of the fancy plug types for your other gear… and it might cost more. If you have two or more batteries for your bike, you could use the Yeti to keep that charged for swapping out with a spent battery. And the Yeti allows you to recharge devices, etc. It is also my understanding that you can ‘daisy chain’ another AGM battery. This is appealing to me for a prospective RV situation, to keep your bike charged & ready to go while you keep the RV parked in a good spot. Adding 100-200 watt PV panels (RV roof) would charge things more quickly. 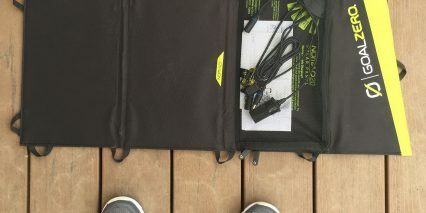 @Court Rye, do you know anyone who has figured out the connections & parts necessary to connect a PV panel directly to the bike battery? 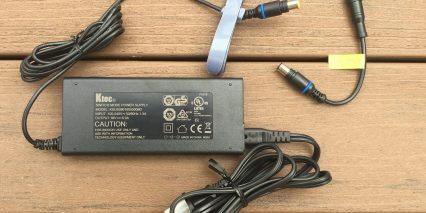 I guess it would mean, essentially, building your own charger “brick” that connects to the PV panel rather than a 110 wall outlet. I think. ? As I’ve researched I’ve found the RV community, on the web and otherwise, to be some of the most knowledgeable and willing to share, self made experts around! Nice article the solution works for what you want. The big question that no amount of googling I’ve done can answer. How the heck do you run a couple of big solar panels directly into a Turbo Levo? As these bikes grow in popularity, a HUGE number of people want to take them to places that are off the grid. Using an inverter based solution is not ideal. 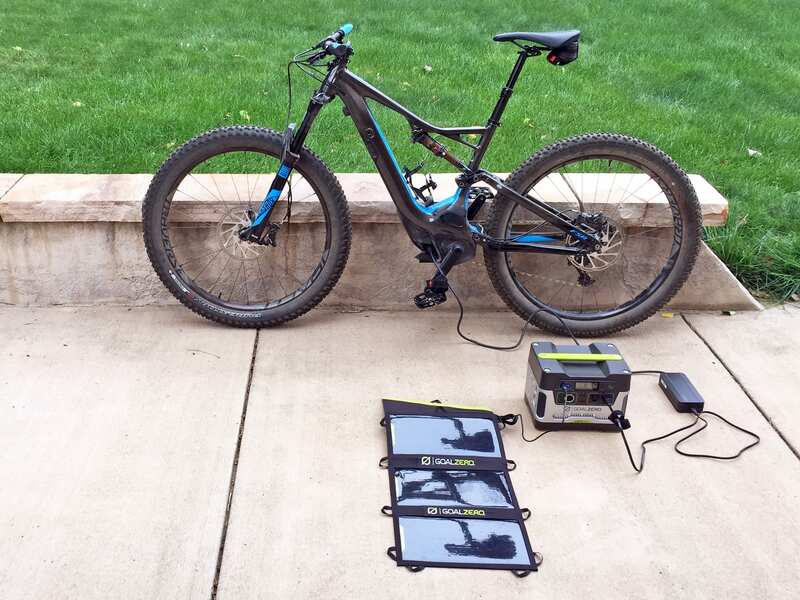 Solar —> Charge Controller —> Levo Battery directly. 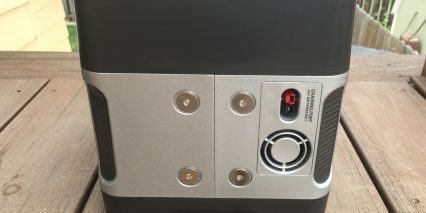 I hear you… was wondering the same thing and would love to hear some ideas (perhaps here or in the forum) on solutions that don’t involve an inverter but also don’t void the warranty. That’s actually not a bad price for the Yeti for what you are getting. What you are missing is the fact that the Yeti has the built in charge controller, and invertor that you will always need along with protective fusing, with multiple types of inputs. (you are going from DC at the panel to DC to charge the AGM battery, but then you have to convert to AC to use the charger from an ebike, which then converts back to DC for the ebike battery. Many losses in all of those conversions and inversions, and step downs on voltage and step back up, etc. 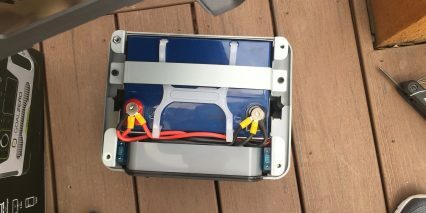 I built my own small portable solar charging station a couple years ago, but I used a 100 AH AGM Battery, solar charge controller that could handle up to 4, 100 watt PV panels. I got some very good pricing on panels and each of the pieces for my set up, and it still cost close to $1000, including 2 100 watt PV Panels. (Renology and Grape Solar). Ideally you’d want at least a 100 AH battery, and go with lithium, but with lithium its even more cost prohibitive to build a solar PV charging station. So here’s the deal. At 11 cents/kwhr electric utility rate, it only cost me 8 cents, to fully charge up a 10 AH ebike battery from a dead start using my home outlet from the local utility. (Used a watt-meter). By comparison, if I can build a small portable charging station, for roughly $5000/kw, ($1000 to build 200 watt station – capable of 400 watts later) amortize that over a ridiculous 25 years, it would still cost me way more than 11 cents per kwhr. And there in lies the rub. Most people just don’t understand the economics of solar PV, where in even if you build one big enough for a home, say thats sized typically 5kw to 10 kw, the power coming out of it amortized over 20 years is still way above 11 cents/kwhr, even at today’s VERY cheap PV panel prices that are below 70 cents/watt. Federal Tax credits (30%), and state credits, and being tied to the grid, make the economics of home solar in places like California, where electricity easily costs 20 to 35 cents/kwhr, a little more appealing, but those solar PV installs usually cannot operate stand alone, like your Yeti and battery and little panels can. 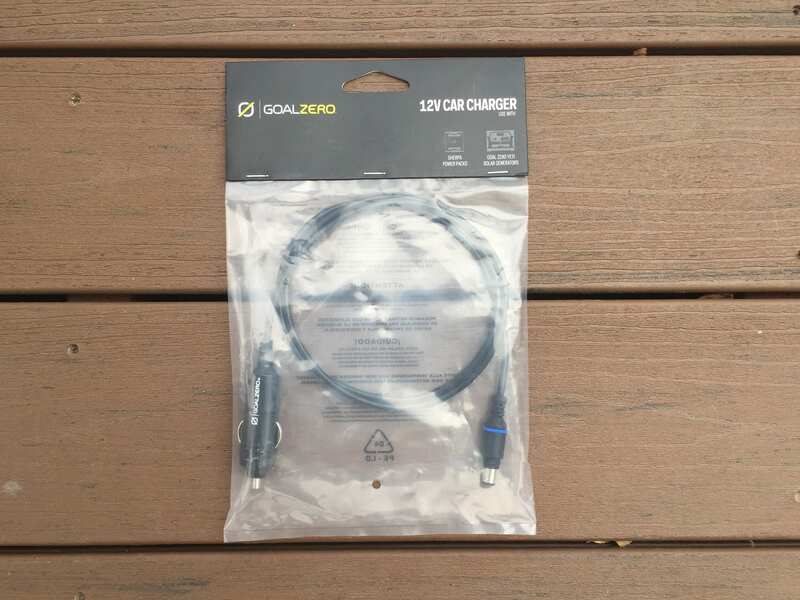 So when you get this small, to size up something for an ebike, its just not going to scale down very well on price, and certainly not on your actual charge cost. I get it though you are looking for some convenience, and ‘clean’ energy’. BUT You can’t go cheap and be safe when dealing with solar PV, at this small of size range. By the way, I’m a certified Solar PV site assessor here in Illinois. I’ve also designed a Charging Station for Ebikes that can be used in public spaces, but I’m waiting for at least another 5 to maybe even 10 years before the economics will make sense. I have 32 years of experience in the energy and power generation space, and watched costs for solar fall a lot, but they still need to fall a lot more, and electric prices need to get consistently above 40 to 50 cents per kwhr, like they are in remote places such as Hawaii, or in socially backward places like Germany, where they have tons of renewables but have driven their electric costs consistently above 35 cents/kwhr. Americans here in the heartland complain about 11 cents/kwhr so they would choke on Germany’s ‘renewable’ power, that often goes down. Now they are putting back in coal plants to keep their grid up and running, since wind and Solar PV cant do that. (not enough grid and generator inertia – can explain that later – too complex for this board). Glad that you looked at the Yeti 400. I got mine “free” using Frequent Flyer points that were on my US bank card. Conceptually its worth a shot, but we got a few more years to go. Maybe when you can by that $100,000 Tesla, for less than $25,000, solar will be viable by then.